People’s lives still hinge upon correct interpretation of handwritten records. Some handwritten records are virtually, or actually, illegible. The prescription above was written for Femara. Premarin was dispensed and harmed the patient who received it. Plaintiff’s and defense attorneys and other reviewers should be familiar with state laws or regulations that permit the patient (or her representative) to require the health care provider to provide a timely transcription of notes. Defense attorneys are not likely to require transcriptions as they are representing the provider, who (if required) would voluntarily produce them. This can be very helpful in expediting the evaluation of otherwise opaque records in the setting of pretrial investigation. If transcriptions were not obtained during the investigative phase, they should be demanded after suit is filed if there is any doubt as to the interpretation of notations. Regardless of when transcriptions were created, it is important for plaintiff’s counsel during depositions to verify the accuracy of the transcription. It is surprisingly common to find errors in transcription, especially when it turns out that opposing counsel provided the document without verifying the content with the witness. Defense counsel will often have the advantage of direct access to defendants for assistance in deciphering medical records, except when dealing with the records of individuals with separate counsel. When in doubt, it is prudent to have the client interpret any handwritten notations of questionable legibility. There will be times, however, when the healthcare provider has no more idea of what the note says than the attorney does. While computerized records have some flaws, they eliminate guessing with people’s lives. Modified from “Attorney Use of Medical Records in a Medical Malpractice Case” and Medical Legal Aspects of Medical Records, Second Edition. 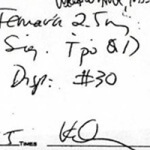 It says: Femara 2.5 mg Sig: 1 po qd (Take 1 tablet by mouth once daily) Disp: 30. For any pharmacist or pharmacy technician that’s no big deal to read. The pharmacist in this case misread it with tragic results for the patient.